Yes, there are also strawberries in this photo. They go into muffins, too. Guess what we're eating from our backyard right now? Berries! How cool is that? Last year our plants were young, and we ate a handful of raspberries from them but never managed to get a strawberry. 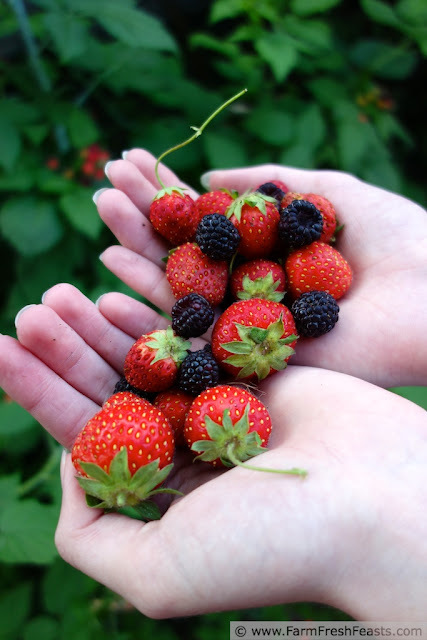 This year we're eating handfuls daily, and I've even put up some strawberries in the freezer. If we don't grow enough raspberries to put up, I'll find a pick your own or some good deals and put up a mess of berries like I usually do. Berries are so easy to freeze (on a metal tray for several hours before transferring to a zip top bag), and they keep in an operational freezer until I'm ready to use them, like in these muffins. Please note my use of the phrase 'operational freezer'. I did not start out with the intention of making a blueberry/raspberry crust so I could make a red, white, and blue pizza. However, I am the sort of person who blooms where she is planted--and this pizza is the logical result of that trait. I love my daughter, really I do--you're sensing a "but" here? Good. It all started when she was hosting her social studies castle-building group. It was fun to see the girls working together all over the main floor of our house. The table in the living room was the main job site and the breakfast nook table was the glue gun station. After each construction session my daughter would unplug the glue gun, and whoever needed the microwave next would plug it back in. Things worked well for the first few sessions, but the third--really, how long does it take to build a castle out of cardboard? Somehow, the microwave remained plugged in, and my little fruit and vegetable freezer aka microwave stand was unplugged instead. No one noticed for a day. Luckily the freezer was due for a defrost before summer "putting up" season got going, and much was still frozen or able to be salvaged. 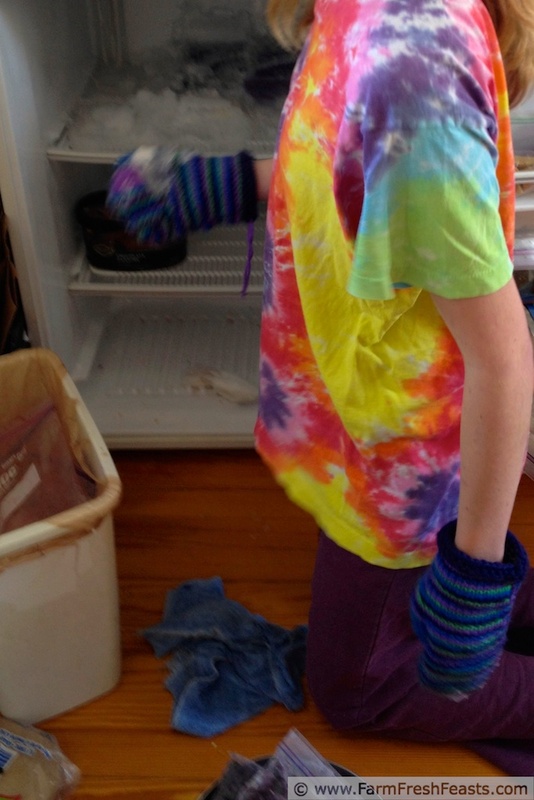 I'm in good company--when Alyssa's freezer died, she made maple dijon chicken. I also chose to get creative, took the bags of thawed blueberries and raspberries, dumped them into my food processor, and made a puree. We had a bunch of smoothies, and I used a cup of it in this crust--thinking I'd make a patriotic pizza. I had leftover cooked chicken in the fridge, and excavated a bag of cranberries during the Big Defrost, so this pizza was predestined. If your grill master is deployed, or you're just not that into the usual red, white, and blue stuff this year--try this. In this pizza, chicken is optional. 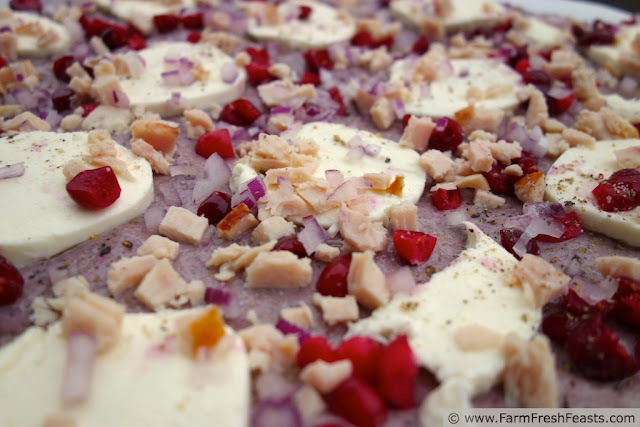 With the creamy fresh mozzarella, tart cranberries, and red onion you can have a meatless, yet still patriotic, pizza. First, the crust. I used a cup of blueberry-raspberry puree, but one cup of either berry would be great instead. Because I don't have the energy to fight fresh dough, I make my pizza dough 2-3 days before Pizza Night. When dealing with fruit puree, as with beets or squash or spinach or kale, the extra days will allow the flour to fully meld with the berries and what was a slightly wet dough ends up being fine by the time you're ready to bake. I used my stand mixer for this one, and placed all of the berry puree, most of the water, the flour, salt, oil and yeast in the bowl. After a few minutes of mixing with the paddle I added the rest of the water, and mixed until a slightly wet dough formed. Please refer to my Pizza Primer for lots of hints and tips for making pizza, and colorful pizza dough, in your own kitchen, and know that if your dough hangs out in the fridge for a few days it's much more relaxed and pliable. On an oiled piece of parchment paper, stretch out dough into a pleasing shape. Brush the crust with a light layer of olive oil. Lay slices of mozzarella across the top, bearing in mind that they like to make a run for the borders once melted, so don't put them too close to the edge of your dough. Scatter cranberries, onion, and chicken if you're using it over the cheese. Add a pinch of salt and a couple of grinds of pepper across the crust. Slide the pizza+parchment onto your baking stone and bake for 5-8 minutes. Shimmy the pizza off the parchment paper, then continue baking for another 3-5 minutes until the cheese is browned and bubbly. Cool on a rack for a few minutes, then slice and serve. This pizza is shared with the From The Farm Blog Hop, Strange But Good at Sprint2TheTable, the Clever Chicks Blog Hop, Tasty Tuesdays, the Wednesday Fresh Foods Link Up, What's Cookin' Wednesday, and What's In The Box at In Her Chucks. In my kitchen, if you unplug it, you defrost it. Wow, way to turn a potential disaster into gold! Gorgeous pizza, fabulous ingenuity! I just cringed when you talked about an "operational" freezer. I could see the disaster coming. Nothing like a group of teenagers to lead to something absent-minded. Glad you were able to salvage! Yum and double Yum. I have a great idea. Ever thought of an extension cord with multiple outlets? Perhaps the freezer will stop being unplugged. My poor spouse would flip if I had appliances plugged into extension cords! He knows his building/electrical codes far too well for that to fly around here. However, nowadays . . . nah, school's out for summer and--wait, let me go check that the sewing machine that she was using this morning didn't bump the freezer . . .
ok, girl! this is the COOLEST THING EVER! LOL! You totaly win #strangebutgood with the berry crust. And the reason behind the creations. I flippin' love it! Ooh, I never win anything. Yay! I'll have a beer to celebrate! What a clever use of your frozen berries + good for you making a delicious, creative use out of a mistakenly-unplugged item. =) Smart mama! Sometimes my worst blunders turn into my best new ideas. This is great. Berry Crust Pizza, how wonderful. I'm visiting from the Farm Blog Hop. The old bearded men in Chitty Chitty Bang Bang were right. I'd love some lemons, actually, I saw this yummy looking strawberry lemonade ice cream on Chocolate Moosey that still has me drooling . . .
ingenious. I trust, as always, this was perfect! 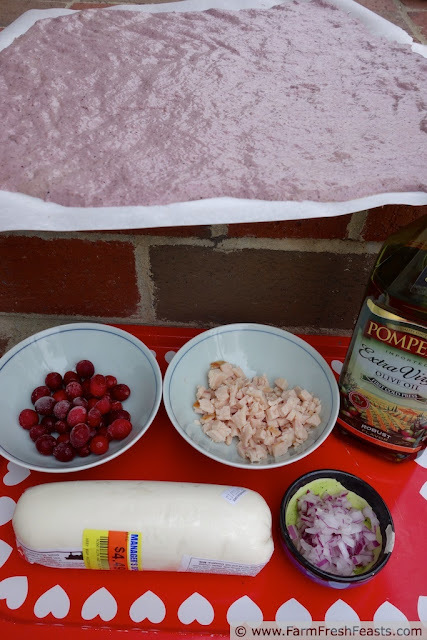 It was very tasty--I like the combo of chicken, cranberry, and red onion so much I'm doing some meatballs out of it next. Wow, how creative is this?! We're huge into pizza, but this goes above and beyond anything I've ever done. Thanks for the idea! When life gives you thawed berries, and your family demands their Friday Night Pizza Nights . . . well, what else can I do? 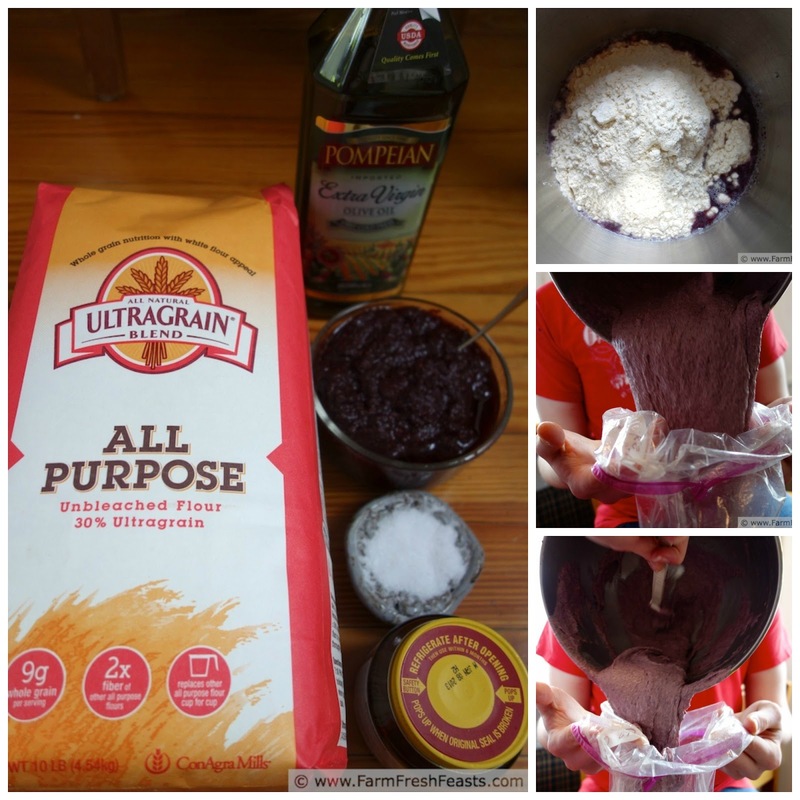 This is so awesome - I love the added nutrients to your pizza crust! Definitely going to give this a try - probably when my 4 year old is helping me cook because he will just get a kick out of adding berries to his pizza. Pinning right now! Thank you for sharing at Tasty Tuesdays, can't wait to see what you link up next week! I realized years ago that my kids would eat spinach crust (My Deployment Pizza) if I turned it into a cheese pizza. That's probably what started this kick of colorful dough. Thanks for co-hosting Tasty Tuesdays! I cannot wait until we are able to have our own little berry patch! :) We live in the city centre and don't even have grass and it's driving me mad! :) Thank you so much for linking up with me this week at Tasty Tuesdays! I’ve pinned this & shared it with my followers! Please be sure to stop back by the party and check out some of the other links! I'm a big fan of community gardens--do they have anything similar where you live? When I lived in Japan we didn't have much room for a garden, but I was able to get a plot in a community garden to grow some food. I've still got a list of things I want to plant if we ever stay in one place for a good long time (Asparagus . . . ) but at least you can dream, right? You are my hero...the end! Thanks for linking up and sharing this AMAZING recipe!!! ps: super duper jealous that you picked those lovely berries from your backyard...I need to step up to your level pronto. I'm so pleased with how our yard is settling into food production. We've lived here 2 years, and the berry plants are pretty happy this year judging by all the produce. WOW, what creativity! 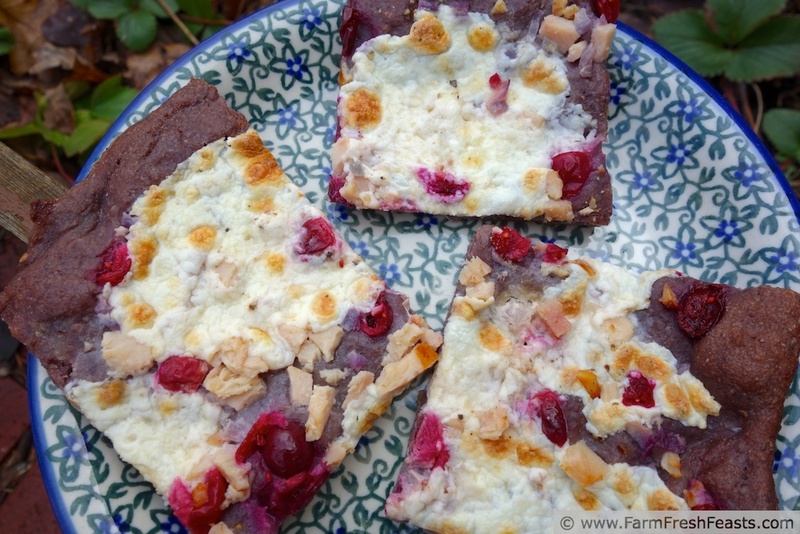 this sounds really good, and the story is a fun one - great scramble to use the berries! Thanks! I really hate to throw away edible food.